Our awesome little team of six for the Furnace Creek 508 awoke at dawn, grabbed some Starbuck’s for breakfast, and chamoised up for a shake-out ride on the tandems. 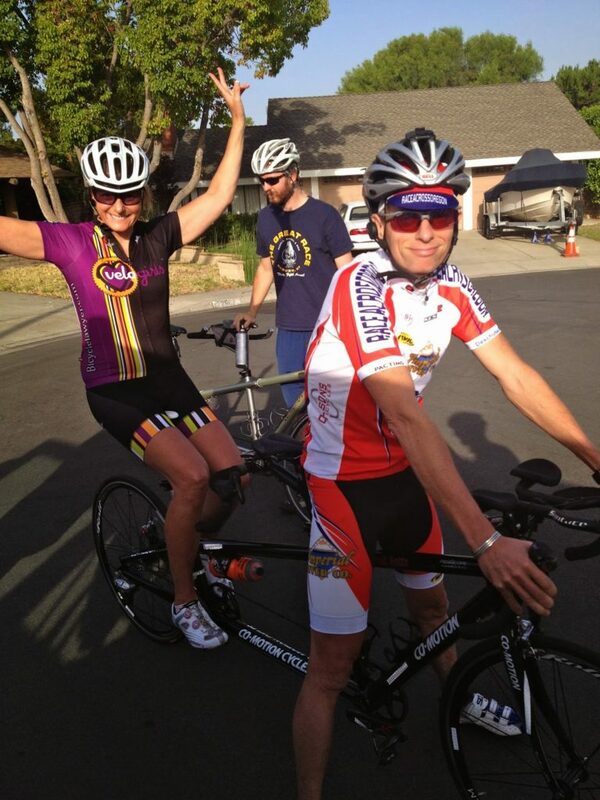 In addition to the four of us racing, our two crew members, Max and Andy, saddled up on the spare tandem at our host house to join us for a short spin. How often do you see three separate tandems out riding together? I’m pretty impressed with our ability to get up and running smoothly. My pilot, Jim Ryan, is a very experienced rider, and we were able to start, stop, shift to an optimal gear, and communicate really well together. We dialed in our bike fit (as much as possible within the constraints of the bike) and I feel confident we’ve optimized our positions. The best piece of advice I received this morning was from our other tandem pilot, Paul Kingsbury (owner of Kingsbury’s Cyclery in Elmira, NY). He said the biggest adjustment as a stoker is that I will feel the bike do things that weren’t caused by MY input. I thought about that several times during our 9-mile ride this morning. We rolled with my Cardo BK-1 bluetooth communication device. It’s a super-cool helmet-mount system that allows two riders to talk to each other. I’ve been testing it out in training the past month or so and I’m sold that it’s a really great system for two riders. If our crew is really smart, we’re also going to connect to one of their smart phones so we can communicate with the support van. Communication will be key for this race. I’ve spent a lot of time in the past month thinking about the experience of riding a tandem and also being supported by a crew. This is very different for me. I’m an independent girl. I live alone. I run my own business. I have no family. I’m used to doing my own thing. So, for the next couple of days I’m integrating into a six-person team and allowing others to advise me and take care of me. It’s a pretty neat experience. Trust is key. I need to trust in the bike. The bike will do what it’s meant to do if we don’t screw it up. I need to trust my pilot. I couldn’t pick a better pilot. Jim is a super-experienced ultra-endurance rider with experience as a tandem pilot on this event. He’ll take good care of me. It’s okay to let others lead. I’m used to being a leader. I’m not used to being a follower. Following can feel uncomfortable to me. My role this weekend is not to be a leader. But I can be the very best follower I can be. I can be a contributor. And that will be more valuable than being a leader in this situation. I will pedal. I’ll cheer. I’ll help out whenever I can. And I’ll let others lead. Intuition is also very important. A stoker can’t be on auto-pilot. I can use verbal and non-verbal cues to help guide me. We’re all packed in the van now and transferring to the host hotel in Valencia. We’ve got race check-in and safety checks on both the bikes and the support vehicle. We’ve got the race meeting this afternoon, with all 700 riders and support crew. And then it’s off to the grocery store to stock up on 24-hours of food for riders and support staff. We’ve been discussing nutrition options, ranging from all liquids to a variety of real food and sports nutrition products, to eccentric snacks like tootsie rolls stuffed with coffee beans. Thank you again to Gary Brustin and Jan Medina for their sponsorship of my race. I wouldn’t be sitting in this 15-passenger van on the 5 in Los Angeles, discussing pickle juice and chamois creme if it wasn’t for their support.